While many individuals are held in high esteem in our denomination, Southern Baptists have only one saint and her name is Lottie Moon. Of course, we don’t refer to her as “St. Lottie,” but the legend that has arisen around her life story qualifies Lottie Moon for the highest regard in Baptist life. After all, who but Lottie Moon set off to serve alone as a single woman to China in 1873? Who but Lottie Moon worked with Chinese women and children, leaving the preaching and mission politics to men? Who but Lottie Moon starved herself to death because she gave all her food and money to feed the Chinese around her? Those questions comprise the legend of Lottie Moon as generations of Southern Baptists have come to know her. Unfortunately, none of the above statements is completely true according to Regina D. Sullivan’s new book, Lottie Moon: A Southern Baptist Missionary to China In History and Legend. The author of this new groundbreaking book grew up Southern Baptist, and is now a professor at Berkeley College in New York. Sullivan contends that many of the hagiographic details of the “Lottie Moon story” were embellished by others in a misguided effort to bolster missions funding, and to camouflage Moon’s advocacy of women’s rights in SBC life. Contrary to both the policies of the former SBC Foreign Mission Board which appointed Moon in 1873, and the current SBC International Mission Board, Sullivan also contends that Moon believed in and lobbied for an equal voice for women on the mission field. The historical record shows that Moon worked not only with Chinese women and children, but also preached to and taught Chinese men and boys when the situation demanded it. And here in the United States, at Moon’s urging, Southern Baptist women organized themselves into the Women’s Missionary Union, despite the opposition of many SBC pastors in the late 1800s. In short, Moon was an egalitarian when it came to women’s service in Baptist life. Regina Sullivan has done Southern Baptists a great favor by pulling back the curtain of misinformation that has surrounded Lottie Moon’s story since her death. Working from primary sources which have never been surveyed comprehensively, Sullivan researched SBC archives at current SBC institutions, but also expanded her inquiries to other institutions such as the University of Virginia, Drexel University, Yale Divinity School, and many other non-Baptist sources. Sullivan’s Lottie Moon is not the typical Baptist biography of Moon, like Her Own Way or The New Lottie Moon Story. Rather, Sullivan has positioned Lottie Moon in the ranks of significant Southern women. Impeccably footnoted and referenced, the endnotes, bibliography, and index comprise a quarter of the book’s volume. The publication of this book by Louisiana State University Press in its “Southern Biography Series” speaks to the quality of her research, and the integrity of Sullivan’s work as an academic. The significance of this book for Southern Baptists is that the real Lottie Moon story is better than the myth. After the Civil War, at a time when women in American society were advocating women’s political rights, Moon was a pioneer in her advocacy for women’s rights within the religious culture of the Southern Baptist Convention. Sullivan skillfully weaves the details of Lottie Moon’s life, the struggles of SBC Foreign Mission Board, the emergence of the Woman’s Missionary Union, and the politics of the Southern Baptist Convention into a single compelling story. At the center of it all was Lottie Moon, a force to be reckoned with in the late 1800s, and after her death a legend to be exploited for fundraising. Moon’s defiance of the SBC Foreign Mission Board when she moved alone from the established mission compound in Tengchow to pioneer work as a single woman in Pingtu is an historical fact that cannot be ignored or rehabilitated to fit Victorian or contemporary notions of a woman’s “proper place.” Had the Foreign Mission Board been prescient enough to anticipate Moon’s entrepreneurial approach to mission work, the FMB would never have appointed her. For the same reasons today, Lottie Moon would not be eligible for appointment by the current International Mission Board. The truth is that Lottie Moon started some of the schools in which she taught, and established and ran the Pingtu mission singlehandedly. While she did teach women and girls, she also taught and preached to men and boys out of necessity, and in defiance of SBC Foreign Mission Board rules for female appointees. This carefully worded IMB statement tries to perpetuate the Moon myth, but carefully de-couples the connection between Lottie Moon’s death and the famine in China. The truth is that in her last days Lottie Moon suffered from an abscess behind her ear. This condition led to bouts of dementia and delusions, which included her refusal to eat solid food. Moon was taking liquids until she slipped into unconsciousness on December 23, and died aboard a ship in Kobe, Japan, at 1 PM on Christmas Eve, 1912. The legend that she starved herself to death because she gave all her food and money to feed the Chinese is not correct. That account appears to have originated with articles written after her death by those who were not present with her on the mission field, and for the purpose of raising additional funds for missions work. Why spoil such a wonderful story? After all, Lottie Moon has been a role model for Baptist mission work and sacrifice for almost 140 years. And, largely because of her story, Southern Baptists have given over $1-billion dollars to international mission work through the SBC Lottie Moon Christmas Offering. But Moon’s story is even more wonderful because she was a true pioneer. Lottie Moon was a woman who grew up in a family that educated its girls, expected them to excel, and gave them room to grow into intelligent, thoughtful young women. Moon’s sister, Orianna, was the first woman in Virginia to study medicine and be granted a medical license. Moon’s family encouraged their young women to find their own place in a rapidly changing society. Moon’s sister, Edmonia, preceded Lottie to China as a missionary, and Lottie joined her and others there in 1873. It is important that the real Lottie Moon story find as enthusiastic an audience as the mythological story did. The real Lottie Moon was an articulate, forceful, determined, and visionary woman who reshaped and probably saved Southern Baptist foreign mission efforts in China. Moon did this by writing compelling articles for SBC and other missions publications. Not only did she plead for more money and more missionaries in these articles, Moon also argued for women missionaries’ right to vote on mission matters; the necessity for women missionaries to lead worship and preach in the absence of men on the field; and, for dropping the pejorative use of “heathen” when referring to the Chinese people and their culture. By reading and acknowledging the real Lottie Moon story over the myth we have long embraced, Southern Baptists will be giving the legacy of Lottie Moon its true and rightful place in our history and heritage. We make people into the heroes we want them to be. Unfortunately, Lottie Moon’s wisdom, fortitude, perseverance, and convictions have been altered in to a “politically-correct” caricature that she would not recognize. We do not need to beatify Lottie Moon. But we do need to embrace her for who she was, what she did, and the manner in which she lived her life. In her case, the real Lottie Moon story is much better than any we could create. We’re indebted to Regina Sullivan for uncovering the real story of Lottie Moon that we in Southern Baptist life have been unable, or unwilling, to see previously. 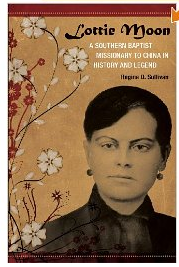 — Lottie Moon: A Southern Baptist Missionary To China in History and Legend, by Regina D. Sullivan. Published in 2011, by Louisiana State University Press in its “Southern Biography Series,” Andrew Burstein, series editor. 253 pages. Also available as an ebook through Amazon’s Kindle books. Disclaimer: I purchased both the Kindle edition and the hardbound printed edition from Amazon, and this review was written solely by me. I received no incentive to review the book. Abcess or not, she weighed fifty pounds when she died. I’ll call her Saint Lottie if no one minds, and even if she didn’t ‘give all of her food away’, she gave China years of service right up until her life’s painful and difficult end. Don’t feel shy to call this good woman a ‘saint’ . . . if someone like her doesn’t deserve the term, then no one does. Calling her a ‘saint’ is a way of giving God thanks for her great witness of Christ. In the way of all the great Christian saints, Lottie Moon possessed that holy ‘fire’ in her faith from which we can still warm ourselves spiritually today. I’m not sure about your source for “she weighed fifty pounds when she died” but that seems to be at odds with the reports of her health as late as September of 1912. According to Sullivan, Moon began to display signs of dementia and delusions in October, and in November her fellow missionaries voted to send her home for treatment. Lottie Moon did contribute to the feeding of people during the famine of 1911-12, and urged others to do the same. But, the story that she purposely starved herself, gave her food and money completely away is not true. Catherine Allen who wrote The New Lottie Moon Story knew this, but was dissuaded from including it in her rewrite of Moon’s life. Moon was a “saint” in the best sense of that term, and you will get no disagreement from me that she gave her life to God in her service in China. We do not need to embellish Moon’s life beyond reality because she was indeed a great Christian missionary. Thanks for your comment. Nice review and I agree that the real story is more inspiring that the hagiography. The starvation myth really ought to be retired. Her 39 years of service are not enhanced by anything in the last two months of her life. The myth probably detracts from her life of service. It is absolutely true that she went to Pingtu alone, served alone, did whatever had to be done – preach, teach, men, women whomever. To use the term ‘egalitarian’ in her context does not mean the same as one reads or uses it today, although I don’t question that she was beyond her peers in this. What? No comment on Toy? I’ve been trying to chase down the jacket illustration of Lottie. It looks way too contemporary to me. Thanks for your comments. The jacket illustration, according to the book flap, is a “Charcoal portrait done by a relative, date unknown.” The source is the Hunt Library, WMU headquarters. It’s the best likeness of Moon I’ve ever seen, and one I had not seen in print before. Not sure what you’re referencing in your “No comment on Toy?” question. Did I miss something? Thanks. The relationship between Moon and Crawford Toy is one of the SBC’s old standbys. Sullivan has a few pages on it. I’m thinking that the jacket illustration of Moon is artwork and done recently to update her look but I haven’t had time to look in to it. I have linked your blog post at my blog, brought it home to my own Mother and her best friend from High school. I have also entered it into the discussion at baptistlife.com/forums SBC trends where our mutual friend William Thornton is active participant. David Miller of SBC Voices fundamentalist fame as well as Jerry Vines monitor Thornton’s blog. Will be interesting to see how this plays with them. Thanks for the comprehensive and well written book review on this important new biography of Lottie Moon. I had always suspected, but had little evidence to support it, that Lottie did what needed to be done to advance Christianity in China whether she was working with women or men. I have always found it ironic that she was chosen as the patron saint of SBC foreign missions above any male counterpart, yet in a denomination that has become increasingly hierarchical in the last 20 years or so. I wonder what her response to her denomination’s strong stance against women leaders and preachers would be today? Have you considered placing a shorter version of your review on Amazon? So far no one has done so, and your affirming words would give the book a boost. Charles, thanks for your kind comments. Yes, we like Lottie, but we like Saint Lottie better now that she’s not around to challenge current SBC thinking. I have thought many times of trying to jump to an ABC church, but I’m sure you guys have your own issues, too. Nature of the beast, I suppose. Hadn’t thought of posting to Amazon, but thanks for the suggestion, which I shall do this afternoon. I hope you’re doing well. I clicked on your NW website and noticed you had been ill. Hope things are looking up for you now. I’m so glad I ran across your review of the book. I intend to get a copy. My wonderful Southern Baptist pastor just preached a sermon including Lottie Moon’s story, so I was intrigued. As a missionary myself (independent of any denomination), I am appalled that I had not taken the time before now to read of her life in more detail. I have to admit my pastor’s version included the self starving details. One very interesting detail he mentioned was that just before she passed away, she was doing hand motions which looked like Chinese hand motions for greetings to saints which were already in heaven. Thus, indicating her spirit was greeting those as she was herself passing into glory. What do you know of these details?